May 25, 2017 – Send Me On Vacation, Inc. (SMOV), a 501 (c) (3) charitable organization, has partnered with Lifestyle Holidays Vacation Resort in Puerto Plata, Dominican Republic to host a group of 15 breast cancer survivors with an all-inclusive vacation to rejuvenate the body, mind, and spirit following treatment. Each recipient will participate in a workshop by the sea that unlocks the power of the inner beauty, strength, and grace that lies beneath the surface of the conscious mind. Tapping into each survivor’s emotional intelligence and focusing on rebuilding one’s emotional fitness post treatment, enables each recipient to create a new pathway of strength, happiness, and fulfillment as they rebuild their lives. Using a cutting-edge process called “Interactive Guided-Imagery,” participants learn to become more connected to their subconscious mind. Lifestyle Holidays Vacation Club has been providing extraordinary vacation experiences to those who Live Their Dreams for years. For more information on Lifestyle Holidays, visit www.lhvcresorts.com or learn about SMOV at www.sendmeonvacation.org. 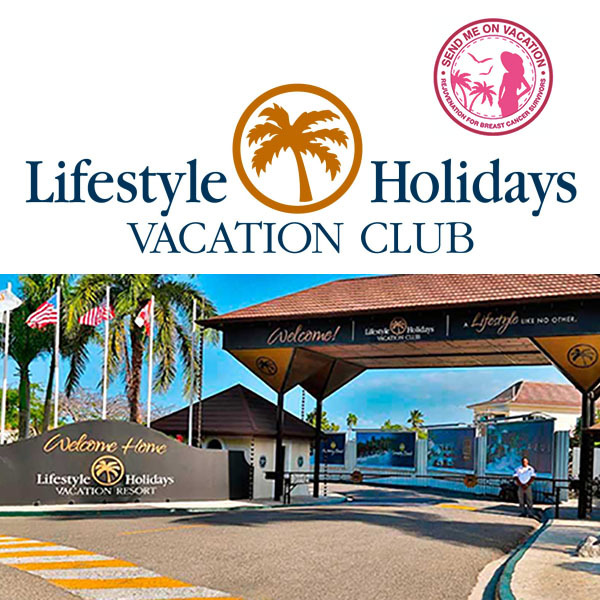 Lifestyle Holidays Vacation Club began in 2002 and offers its members a wide range of membership options designed to fit most budgets and individual needs while providing a large array of unique, luxurious travel destinations in Puerto Plata, Punta Cana and Mexico. LHVC has created a one-of-a-kind V.I.P. membership that offers exclusive members-only access to facilities and services such as lounges, bars, swimming pools and specialized transportations services such as; limousines, helicopter transfers and more. The distinct developments of Lifestyle Holidays Vacation Club in the Dominican Republic include: The Tropical, The Crown Suites, The Crown Villas, The Royal Suites, The Royal Villas, The Residence Suites, The Presidential Suites – Puerto Plata, Dream Suites by Lifestyles Puerto Plata, The Presidential Suites – Punta Cana, Dream Suites by Lifestyles Punta Cana, Dream Suites by Lifestyles Bávaro, Dream Suites by Lifestyles Bayahibe, Dream Suites By Lifestyle and Presidential Suites by Lifestyle in Boca Chica, Cofresi Palm Beach & Spa Resort, and Costa Esmeralda Villas, as well as Villa Park Villas & Suites and Cap El Limon in Samaná, both currently under construction. For more information on Lifestyle vacation experiences in the Dominican Republic and Mexico, go to www.lifestyleholidaysvc.com. Send Me On Vacation, Inc., a 501 (c)(3) charitable organization, provides healing vacations to breast cancer survivors who are financially devastated by the cost of treatment and need a chance to rejuvenate their body, mind, and spirit. A resource based, all volunteer group of travel and tourism professionals, utilizes unused inventory to create healing vacations for survivors giving them the “break from cancer” needed for emotional recovery. You can join the cause today through volunteerism, sponsorship or by making a donation to www.gofundme.com/breast-cancer-world-tour.